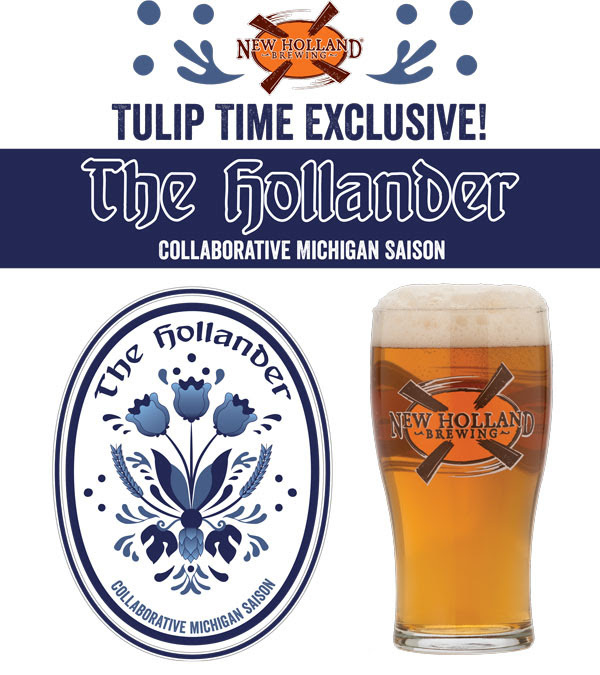 Holland, Mich–New Holland Brewing is proud to release their 2016 Tulip Time brew – The Hollander! On Tuesday, April 26, New Holland’s collaborative brew, “The Hollander – Michigan Saison” – hit taps at their Downtown Holland Pub on 8th. The Hollander is collaboration between New Holland, Tulip Time, the City of Holland/Windmill Island, and several Michigan suppliers, including Empire Hop Farms, Top Hops, Hopyards Of Kent, Hophead Farms, Michigan Malting, Pilot Malt House, and Craft Cultures. The Hollander is pure Michigan from top to bottom, featuring a yeast strain from the tip of the Keweenaw Peninsula in the U.P., all Michigan-grown hops, Michigan-grown and malted barley, and pure Lake Michigan water. New Holland has been a longtime supporter of Michigan agriculture; with 100% of their pub specialty beers brewed with 100% Michigan ingredients, 100% of the time. Also, several production beers and spirits feature Michigan-grown ingredients, such as Michigan Awesome Hatter (Michigan IPA), The Carhartt Woodsman (Wood-aged Pale Ale), Mad Hatter (Midwest IPA), Paleooza (Michigan Pale Ale), Pitchfork Wheat Whiskey, and new release Blue Haven Gin, featuring Michigan blueberries. New Holland has been supporting the Tulip Time Festival for nearly a decade and is proud to once again be brewing the official beer for this Holland, MI based festival which is one of the largest festivals in the country. Tulip Time will run May 7-14 with multiple parades, concerts and events throughout the week. The Hollander was officially “tapped” on April 26 at the New Holland Pub on 8th following an event for the Tulip Time Board and is available at many local Holland establishments through mid-May as well as the New Holland Pub on 8th in downtown Holland along the parade routes. It will also be featured at various Tulip Time festivities throughout the week of the festival. For more Tulip Time information, visit their website.